We’re excited to announce the start of the Spring tulip screenshot contest, get out there and take some amazing pictures! Below you’ll find details covering this week’s patch notes, so catch up on the latest changes while you download this week’s patch which is ~ 475MB. Black Spirit’s Adventure Game has been extended. Make your mark on Black Desert Online by participating in the Spring Tulip Screenshot Contest where players will get a shot at having their screenshot put on display in game, check >Here< for more information. The Cherry Blossom event has ended and the [Event] Cherry Blossom items have been removed. [Guild] Cadria Elephant has been added. The Cadria Elephant has marked patterns on its horn and has an increased amount of max HP compared to Tier 1 Elephants. This Elephant is Tier 2 and upon registering it in the guild stable will learn 1~3 skills immediately. Fixed an issue where Tamers interacted with the Golden Goose Egg, the egg would become transparent. When Maehwa equipped ‘Small Drum’ item and falls from a high elevation, the ‘Small Drum’ item will now correctly appear in front of the character. New Jukebox item ‘[Jukebox] Piano Work #1 Serendia' has been added. The Anemos Outfit now has a special animation, this animation only occurs when in a non-combat stance and when the character is not in motion. Fixed an issue where equipping the [Ninja] Anemos Outfit Set and in a non-combat stance would cause the weapon to be visible. Fixed the issue with the Anemos Costume where some classes (Ninja & Warrior) could not dye costume pieces after the durability was diminished. Guild Master only quests which reward Valencia Elephant (Tier 1) and/or [Guild] Ship Registration: Galley have been added. Fixed an issue where some wild horses in Serendia and near Marni Farm Ruins were getting stuck in the terrain. Some mini-map functions that were not working as intended have now been fixed. The mini-map crashing issue caused by opening the Customization interface (F4) while using the mini-map has been resolved. *Due to technical UI limitations this reward will not be visible in the game list, yet you will receive it. Can you guys bring Pearl Abyss to look at the potatoes you call server infrastructure? I wonder what is wrong. Patch notes normally is never up before the game is up after maintenance. You should probably just go ahead and delete valks. Kek wut, no premium pr0n outfit for DK? Fail. Why no kibelius awakening for dk?? One of the more boring ones, ey? I downloaded 600 mb something anything else you added? 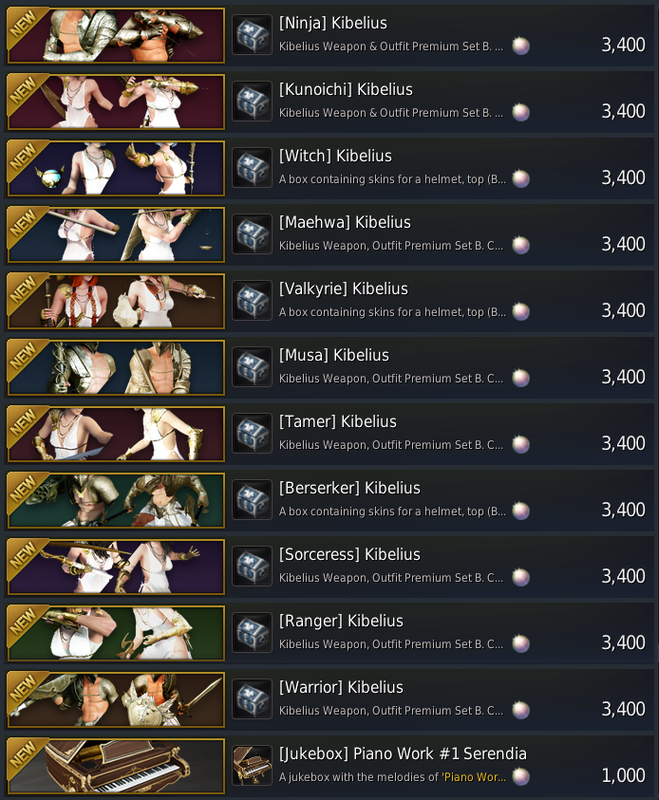 kibelius armor was released last year why you trying to resell this armor for more pearls than it previously was ? Because it also covers the awakening weapon this time.